In the last eight years, the city portion of your tax bill has gone up an average of 3.47% per year. The overall tax increase is 1.92% annually when blended with Regional and Education taxes which make up about two-thirds of your tax bill. The summary was presented as part of a budget information report coming to the July 9 Committee of the Whole meeting. Due to the October municipal election, city budget deliberations will be delayed till January, with final budget approval expected in March. With the intense rush for development of up to 30 storey hi-rises, towns and stacked townhouses, detached and semi-detached homes, we should then see sooner than later, a huge decrease in our city taxes due to the huge surplus of funds flowing into the City coffers. 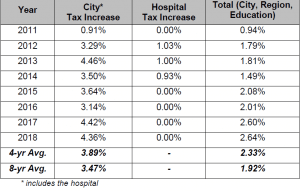 This city portion increase in unacceptable, far above any inflation during those years. Our main roads are in bad shape, New Street from Walkers Line to Burloak. Spruce Avenue is an eyesore of half demolished houses, outhouses, houses that have been under construction for years and abandoned houses with unkempt property. Where are our Bylaw officers?